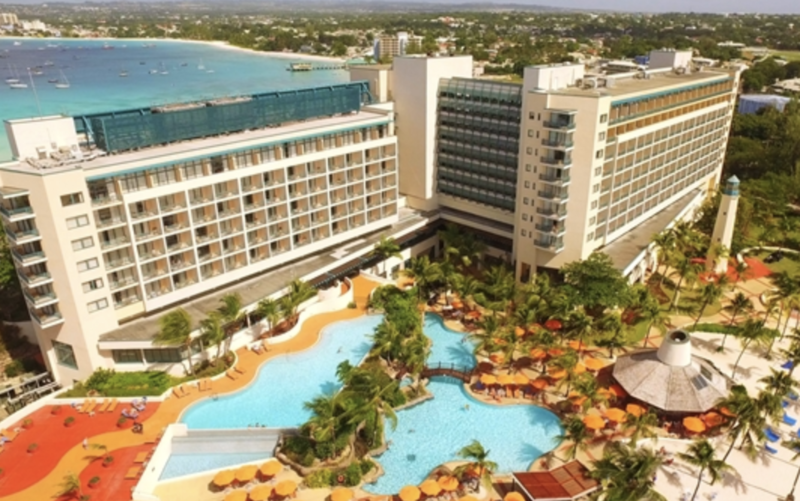 Jill Sayles checked into the Hilton Barbados Resort for a conference but, in between seminars, managed to find some time to appreciate the wonderful ocean views and chill out on the glorious beaches. Location: The property is situated in the south of the island, on Needham's Point peninsula with access to two white-sand beaches. It's on the site of the 17th century Fort Charles, which is on the UNESCO World Heritage list. The hotel is a 10-mile drive from Grantley Adams International Airport (BGI) and is a convenient five-minute drive or 20-minute walk to the island's capital, Bridgetown. First impressions: Driving up to the hotel, the cream-coloured, plain rectangular block resort buildings are not the prettiest but I felt happier once I'd stepped into the large and airy reception area and saw the fabulous ocean views. During a long wait for check-in (I'll come back to that later) there was an opportunity to explore the resort and enjoy the gorgeous views. Bedrooms: All 355 rooms have private balconies overlooking either the Atlantic or Carlisle Bay and feature wood-grain floors with modern furnishings. Suites offer separate work and rest areas and along with the executive rooms, include continental breakfast and hors d'oeuvres in the Executive Lounge. I had a Bay View room on the third floor, which was spacious and modern. Decoration was mostly beige and white with splashes of colour on cushions and pictures. I slept well as there was no noise to disturb me and the double bed was comfy. There was a balcony big enough to stretch out on and sunbathe a work desk area, high-speed internet, an easy chair wardrobe and safe, widescreen TV and a bathroom with bath and separate shower. Facilities: There are two beaches, bordering the peninsula, an infinity pool complex (two swimming pools and a hot-tub), an on-site diving centre, water sports (offering snorkelling gear, kayaks and boogie boards), a gym, three floodlit tennis courts, a Kidz Paradise Club and a large hotel meetings space. The Eforea Spa claims to be the only spa in the Caribbean to have a heated sand massage bed. Family friendly: The larger pool and clean beach are ideal for children, although I wouldn't recommend young ones swim in the sea as it's not the calmest of waters; fine for a paddle though. There's also the Kidz Paradise Club with an entertainment programme and buffet-style meals at the Lighthouse Terrace. Wining and dining: There are four bars and restaurants offering casual dining, a gourmet menu, a lobby lounge and beach bar. Breakfast, lunch and dinner are available at the Lighthouse Terrace restaurant for a casual dining experience with the option of eating inside in the air-conditioned area or outside on the terrace. 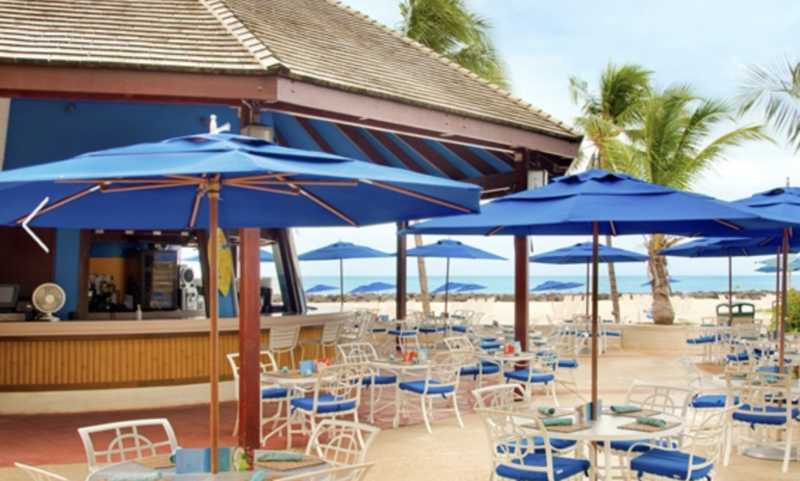 The Water's Edge Bar, a pool-bar gazebo, has casual lunch and snack options and serves cocktails. The gourmet restaurant, The Grille has an a la carte menu of seafood and grilled meats with local flavours. The Careenage Bar is a smart-casual place to meet for drinks before dinner and the venue - which is designed in nautical style - offers sunset views of the south coast. I had a memorable dinner at the speciality Grille restaurant which serves signature steaks and locally caught seafood. I chose a tuna steak main dish which was a very generous portion and delicious. The waiter service was also friendly and attentive. I loved the breakfast at the Lighthouse Terrace offering freshly made omelettes and Bajan treats such as sweet bread and corn fritters. Highs: The clean and beautiful beach with plenty of beds and hammocks to lounge on. Having visited as part of a conference, the meetings space worked well for delegates who used the 500 person capacity ballroom. There's also four air-conditioned rooms seating 14-170 people with ocean views. Coffee breaks are taken on a shaded terrace area. Lows: The long check-in. I appreciate I was part of a conference group but I still think it should have been quicker. Verdict: It was an ideal place to stay for the meetings and event I attended. 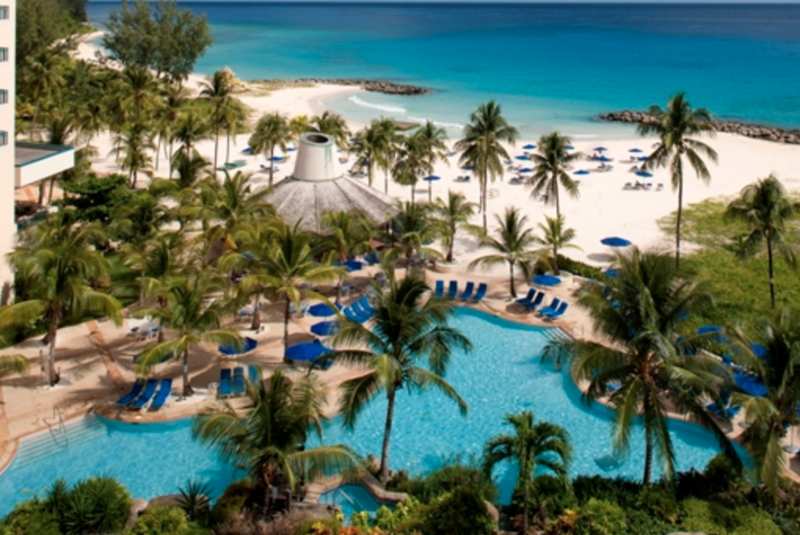 All facilities were well laid out and the resort is a good location being close to Bridgetown. I would definitely stay there again to mix business and leisure. Rooms start from $278 (£207) per night.